The magnificent City Palace is in the centre of the Pink City of Jaipur, enclosed by high walls and set amid fine gardens and courtyards. 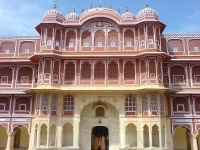 Since Jai Singh built it in 1728, it has been the principal residence for the Maharajas of Jaipur and successive rulers have each added to it. The palace was built during the glory days and the exhibits and interior have lost none of their splendour: the doors and gateways preserve their flamboyant decoration; and royal retainers, clothed in turbans and full livery, still guard the principal halls and entrances. A beautifully-carved marble gate with brass doors leads to the second courtyard, where Diwan-I-Khas, the hall of private audiences, is found. On display here are two gigantic silver urns used by Madho Singh II to carry water from the holy Ganges with him when he travelled to London in 1902 on board an ocean liner - he was reluctant to trust the water in the West! These are said to be the largest silver vessels in the world - 243kg of silver was required to cast each urn, and they can hold 8,182 gallons of water.